5, 4, 3, 2, 1… It’s definitely time for a blast of fun across the four action-packed floors of the Discovery Space Centre from Hape. We’ve searched high and low and this is definitely the toy space ship for the preschool set! In fact, it’s more a boy’s doll/playhouse than a toy rocket. Each of the four floors is dedicated to a different aspect of a Space Odyssey-lifestyle with areas for dining, living, as well as (of course) commanding the spaceship, plus a refuelling depot, landing pad, and alien, robot and astronaut characters. The top floor of the rocket even ‘lifts off ‘ from the rest of the spaceship to launch astronauts (and their all-powerful preschool flight director) into a universe of fun. Good For… Imaginary play; story telling and role playing; dexterity; hand/eye coordination, and manipulation. Keep in Mind… It will need a dedicated space in your house. This is more of a playhouse than simply a toy. So be aware that you won’t be wanting to pack this away every night! What Kids Love What’s not to love: it’s a rocket; it’s a playhouse and there are aliens! What Parents Love With 37 parts to this Space Centre, you can hand out one piece at a time as rewards for anything from potty training to whinge-control. Awards Winner of the Oppenheim Toy Portfolio Award in 2011 and the Parents Choice Gold medal in 2010. Designer Details Hape Toys are one of the world’s largest manufacturers of toys made from sustainable sources. 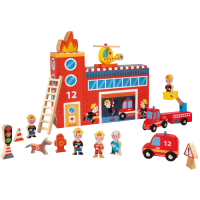 Priding themselves on a commitment to global thinking and responsible ecology, Hape have been creating toys which consistently beat international safety standards since the company was founded by Peter Handstein in 1986. Each product is designed to improve children’s key developmental skills through age-appropriate methods while simultaneously inspiring creativity, play and exploration.